Drew McDonald (34) shoots during the game against Coastal Carolina. McDonald shot 8-of-12 from the field on the night. 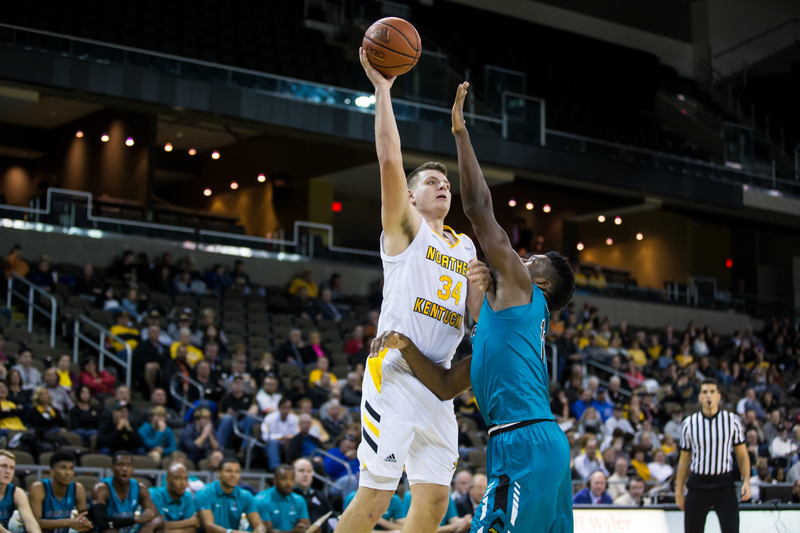 NKU senior standout Drew McDonald has been named to the 2018-19 Lou Henson Award Watch List for the second consecutive season. This award is presented to the nation’s top mid-major player in Division I college basketball and will be presented at the College Insider awards event in April at the site of the men’s Division I National Championship in Minneapolis, Minnesota. McDonald is one of two Horizon League Conference players on the Lou Henson Award Watch List, joining Wright State center Loudon Love. A preseason Horizon League Player of the Year and Karl Malone Power Forward of the Year candidate, McDonald is averaging 18.8 points and 10.4 rebounds through the first eight games of the 2018-19 season and his four double-doubles rank ninth in the country. In the Norse’s matchup at Morehead State on Tuesday night, McDonald collected the second triple-double in Norse history with 12 points, 14 rebounds and a career-high 11 assists. The Cold Spring, Kentucky native is also rapidly approaching the Norse’s all-time rebound record. He currently ranks second in Norse history with 845 and only needs 15 boards to break LaRon Moore’s record of 859. McDonald and the Norse are off to their best start (7-1) in the Division I era and will return to action on Friday, Nov. 30 as they host last season’s NCAA Tournament bracket buster, UMBC. The Retrievers made headlines last year when they became the first no. 16 seed to upset a no. 1 seed (Virginia) in the NCAA Tournament. Tipoff is scheduled for 7:00 p.m. and will be broadcasted on ESPN+. Lou Henson coached forn41 years and was sixth all-time in career Division I wins with 779 when he left the game in 2005. He is also the winningest coach at both Illinois and New Mexico State, where he is one of only 12 coaches in the history of the game to take two schools to the Final Four.